In the aftermath of the Financial Crisis, many com­monly held beliefs have emerged to explain its cause. Conventional wisdom blames Wall Street and the mortgage industry for using low down pay­ments, teaser rates, and other predatory tactics to seduce unsuspecting home owners into assuming mortgages they couldn’t afford. Conventional wisdom also blames average Americans for borrowing recklessly and spend­ing too much. And it blames the tax policies and deregulatory environment of the Reagan and Bush administrations for encouraging reckless risk-taking by wealthy individuals and financial institutions. 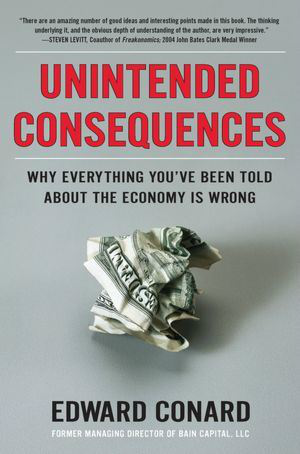 But, according to our summary of Unintended Consequences, by Edward Conard, the conventional wisdom masks the real causes of our economic disruption and puts us at risk of facing a slew of unintended, and potentially dangerous, consequences. Conard was a partner at Bain Capital from 1993 to 2007. He served as the head of Bain’s New York office and led the firm’s acquisi­tions of large industrial companies. In an attempt to set the record straight and fill the void left by other analysts, Conard presents a fascinating and contrarian case for how the economy really works, what went wrong over the past decade, and what steps we can take to start growing again.